Teen Wolf fans are baking cookies for show creator Jeff Davis to persuade him to pair up the show’s two male leads, scoring a trending Twitter hashtag along the way. It’s so crazy that it just might work. As you probably know if you’ve spent any time in fandom lately, the Teen Wolf fandom has been extremely vocal for months on the subject of Sterek, their favorite pairing that isn’t actually on the show. Those who ship the show’s male leads, Derek and Stiles, have turned the couple—dubbed “Sterek”—into a massive fandom all on its own. It even has its own theme song. 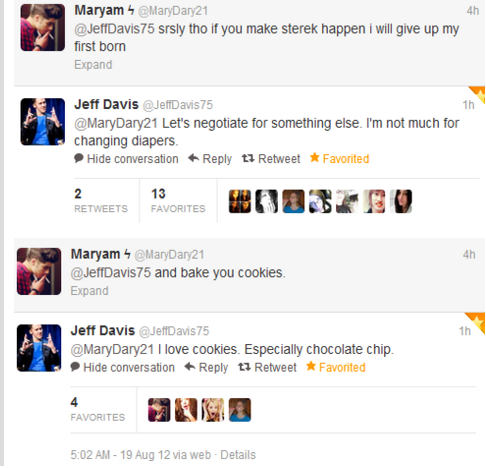 #CookiesforSterek is taking him at his word. If the campaign can seem a little like zealotry at times, it’s important to remember that Teen Wolf’s production marks the first time in history that the creator of a U.S. television show has not only courted fans of a queer pairing, but informed them that it might actually happen. Although mainstream Hollywood has recently improved queer visibility, with characters like Kalinda on The Good Wife and shows focusing on gay men like Glee and The New Normal, letting gay relationships evolve naturally over time is still a novel thing. Often, if fans get any nod to the existence of queer characters whose sexuality isn’t explicitly a part of the storyline, it’s through subtext only. Occasionally, validation occurs in a separate, fan-designated space, like the Battlestar Galactica webisodes, or the infamous “Dumbledore was gay” declaration that J.K. Rowling made only after the Harry Potter series had ended. Teen Wolf is different from all of these things: A show without a predetermined queer storyline that might actually be tempted to write one in because of its popularity with the fanbase. If Teen Wolf goes this route and fans are pleased with the results, it could influence other shows with huge fan followings to reconsider relegating their slash ships to winks and nods between the lines. The goal of The Sterek Campaign is to ensure that Jeff Davis is aware of just how much the fans would support him if he were to make Sterek a canon couple—we want an “established will-they-won’t-they, scripted” relationship, and to get that we need to make our voices heard. The campaign has other ideas in progress already, such as next month’s campaign, “Howls for Sterek.” Later on, the group has plans for a wolf-related charity campaign. Well, no one’s confirming that Sterek’s going to happen in Season 3 of Teen Wolf. But the campaign’s stated goal, at least for now, was to get #cookiesforsterek trending, which they did. And, of course, to make sure Davis noticed them. Sounds like they’re off to a promising start.